It is really unfortunate to have someone who seems to be educated light Bwana Jean de Dieu Basabose but when you look at his approach to peacebuilding in Rwanda he is prone to advancing one narrative on the Rwandan genocide of 1994 that it is a genocide against the Tutsis of which he belongs. I am a Hutsi who survived two genocides that were perpetrated by Rwandans. A Hutsi is a Rwandan person whose parents come from both Hutu and Tutsi tribes. Such kind of people have been marginalized by both community since the 1994 genocide. Hutus do not trust us because they believe that we identify ourselves more with our uncles on our mothers’ sides and on another hand Tutsis call us Interahamwe because they believe that we carry our fathers’ identity. However, in this article I want to be more professional and focus on issues at hand that I would like to highlight in this article. Those issues have affected Rwandans for the last 21 years and have been avoided in most if not all genocide functions that I have been attending ever since. Without dealing with them it does not matter whether we have been mourning for the last 21 years and a lot of donors money has been pumped into peacebuilding and conflict resolution projects and many prayer groups vigil we would conduct we will never achieve a lasting peace and reconciliation in Rwanda. Today I want to take one of these cases as addressed by one of Rwandans involved in peacebuilding so that we identify the missing parts and see how we can patch them together to build a new cohesive Rwanda. I would like to correct Bwana Jean de Dieu Basabose on his articles regarding genocide in Rwanda. First, for those who don’t understand well what really happened in Rwanda in 1994 and afterward they might be misled by Jean de Dieu Basabose explanations of what really took place in Rwanda 21 years ago. I was 16 then old enough to see what was going on. I am now 37 old enough to be educated like Mr. Jean de Dieu Basabose and also enlightened enough to differentiate academic facts from fictions and propaganda. · Truth: His peacebuilding approach does not incorporates search for truth among Rwandan communities. He builds his peacebuilding efforts on the RPF official narrative that Hutus killed Tutsis therefore they should assume responsibilities of the sins committed by their clansmen and ask for forgiveness since they are criminals by default. 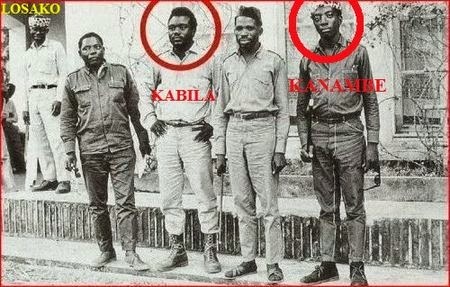 This is not true because we now all know the truth that not only Hutus who killed other Rwandans. Jean de Dieu Basabose who is an Insight on Conflict's Local Correspondent in Rwanda has not lived up to one of their themes which is about “Reconciliation is generally understood to be the reestablishment of friendly relations, though it assumes different forms and roles in different contexts. In the case of armed conflicts, reconciliation incorporates the search for truth, justice, forgiveness and accommodation between conflicting groups or people.” Here I would say that in the case of Rwanda and Rwandans, reconciliation incorporates the search for truth, justice, forgiveness and accommodation between conflicting which in this case are both Hutus and Tutsis in Rwanda. Allow me to use the above definition to demonstrate how Mr. Jean de Dieu Basabose has not been living up to his calling of a peace builder in local contexts but to self-promote and advance the Kigali mission of winning international sympathy and undermining the wellbeing of Rwandans both living inside and outside of Rwanda. The truth is that Rwandan genocide took place and killed both Hutus and Tutsis as we find it in the Kigali’s record that over a million Rwandans were killed. In a country which has 6 million Rwandans of which 14% were Tutsis and 84% Hutus it means that if a million Tutsis had been killed then all 14% would have been wiped out including Mr. Jean de Dieu Basabose who survived. Statistically this is incorrect because according to the IBUKA records more than 500 thousands Tutsis survived during the genocide out of 14% of 6 million Rwandans. This means that in 1994 there were 840000 Tutsis in Rwanda. Therefore, Hutus were 5,040,000 whereas Twas were around 60,000. Now let’s come back to the truth that promote reconciliation in Rwanda and empowers peacebuilding initiatives is that according to IBUKA more than 500,000 Tutsis out of 840,000 Tutsis survived. This means that the brutal genocide of the 1994 took the lives of 340,000 innocent Tutsis not one million as Mr. Jean de Dieu Basabose wants all of us stupidly to believe. I would expect better narrative from Mr. Jean de Dieu Basabose because he is one of the few Rwandans who have had opportunities to study in Western countries where the academic fraternity expects you to be of good standards when you address issues that affect lives of people and avoid being easily drawn into political biasness of Rwanda. Like so many Rwandans who are yearning for a genuine reconciliation in Rwanda, I would expect him to be objective in how he addresses the issue of peace and conflict in Rwanda because we are all looking up to him so that we forge a better Rwanda for all Rwandans regardless of their social background. According to IBUKA, more than 1 million Tutsis and moderate Hutus were killed in 1994. Let’s assume it is true for now. Let’s look at the tangibles such as 340,000 Tutsis killed out of 1 million Rwandans we will find that close to 600,000 Rwandans are unaccounted for and were members of the Hutu communities. Both Ibuka, Mr. Jean de Dieu Basabose, and the international community tell us that only moderate Hutus killed by the same Hutus who were carrying out the massacre. If that is the truth that we seek to find in order to mold Rwandans into a one united and reconciled community, then who killed this 600,000 Hutus in 1994 if not the Tutsi dominated the Rwandan Patriotic Front headed by Paul Kagame? If Mr. Jean de Dieu Basabose could write another article in the Insightonconflict to clarify who these 600,000 victims are and who killed them, then he would be contributing positively to peacebuilding initiatives that all Rwandans aspire for. To prove my argument is that in 1995 the UNHCR commissioned an investigation on the RPF killing in Rwanda which was carried by The "Gersony Report" is the name given to the 1994 findings made by a team under Robert Gersony, which was under contract to the United Nations High Commissioner for Refugees and identified a pattern of massacres by the Rwandan Patriotic Front rebels during and after their military victory in the civil war in post-genocide Rwanda. Another good readings on the true of what really happened in Rwanda in 1994 that I can suggest to Mr. Jean de Dieu Basabose is the report compiled by the two American academics Christian Davenport and Allan C. Stam called “What Really Happened in Rwanda during the 1994 Genocide” then you will understand that, apart from the western politics, actually more Hutus than Tutsis were massacred by the current regime in Kigali not the other way round. This means that we should not only commemorate a Tutsi genocide but a Rwandan genocide because we all killed each other and we all lost our beloved ones that we should have to mourn for and accept our country’s history as Rwandans. Once we tell to the whole world this plain truth with the same earnest and energy we used to tell them lies, then Rwandans will some inches away from genuine reconciliation. · Justice: Mr. Jean de Dieu Basabose and his Shalom project have told us the truth about the 1994 Rwandan genocide, then all Rwandans both Hutus and Tutsis would have been empowered to look for justice as one of the genuine pillars of reconciliation. According to the UN Mapping report on DRC 2003 and the BBC’s documentary The Rwanda’s Untold Story, the shooting down of the Rwandan presidential plane that was carrying two Hutu presidents, Habyarimana Juvenal of Rwanda and his counterpart Cyprian Ntaryamira of Burundi who perished in that terrorist act, this sparked the Rwandan genocide. Paul Kagame is the one who ordered the shooting of the plane and he should be held responsible for this terrorist act so that Rwandans both Hutus and Tutsis can find justice for their loved ones killed by both Interahamwe and Inkotanyi/RPF. So far this has never happened in Rwanda. People like Mr. Jean de Dieu Basabose have continued advocating for a crooked justice and shady peacebuilding activities in Rwanda in order to protect their own selfish interests and fundraise in Western countries lying that they are promoting peacebuilding among Rwandans and yet their activities are the main ingredients of deep hatred and resentment among Rwandans because they are partisan in design and implementation. For example the pro-Kagame peace organizations such as Shalom of Mr. Jean de Dieu Basabose ask Hutu kids and youth to ask for forgiveness to their Tutsis colleagues for the sins committed even before they were born, simply because they are Hutus and yet some of these kids lost their parents to RPF gun bullets, but they have no rights to seek justice because they are Hutus and are considered to be a second class citizen. Wouldn’t an n organization such as Shalom Peace Education seek justice for all regardless of political consequences in order to build a new Rwanda that makes us all comfortable of being Rwandans rather than promoting that narrative that Tutsis are the innocent victims and Hutus are bloody criminals and yet they were killed most? In Rwanda there are those Hutus who have been behind bars since 1994 without any justice nor even appearing before any court of justice. Recently, it emerged that more than 8,000 Hutu prisoners have no file or any kind of record that demonstrate what they have been accused of and yet 18 years later they are still behind bars and most probably they will be executed, simply because they were born Hutus. This issue was also discussed during the annual RPF retreat of Umushikirano. If organizations such as Shalom were genuine about reconciliation then they should have started from Rwandan prisons because they know well that many of the accused are innocent. 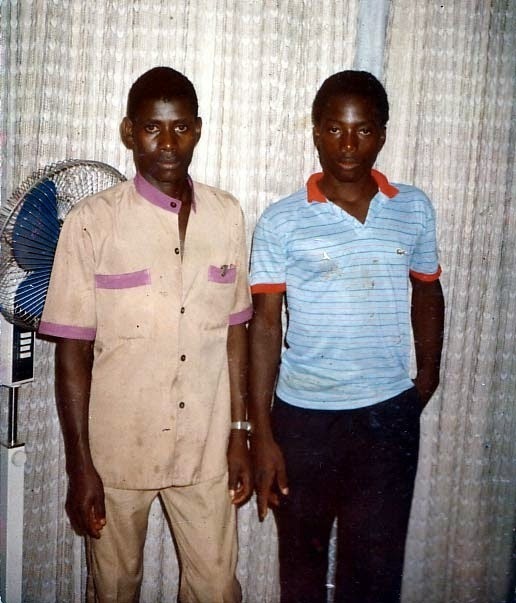 · Forgiveness: It is hard to know who should forgive who in Rwanda. Apart from the roadside shows of the Kigali’s government supported by the organizations in peacebuilding in Rwanda and religious people such as Pr. Rick Warren who is the founder and senior pastor of Saddleback Church in USA, there is no forgiveness among Rwandans 21 years later. Kagame and his men such as Mr. Jean de Dieu Basabose will tell you that they have done a great work now communities are living together peacefully, but it is white lie. Rwandans are coexisting not living together. They have no options but to coexist. Majority of Rwandan families from the Hutu community has lost their believed ones to RPF kidnapping and disappearing and have not even bothered to report this because they know well who did it. When they don’t say anything does not mean that they are happy or reconciled they just want to live and see another morning rise but inside themselves they know how much hurting they are experiencing. Organizations in peacebuilding and religious activities in Rwanda together with the RPF government will call the media personality, especially the international media and bring well-rehearsed Hutus and force them to give bogus testimonies detailing how they are happy and forgiven. However, this is not what you see down on the grassroots level. Where there is reconciliation and forgiveness all communities are treated equal but that is not the case in Rwanda. Hutus are to be seen not heard. When countries like: US, UK, France, Canada, Australia, Germany and etc. give scholarships to young Rwandans to go and acquire much needed knowledge in those countries, that is when you recognize who owns Rwanda. Out of % only less than 1% of Hutu children you find getting such opportunities and the rest is a reserve of the chosen few who are Tutsis. 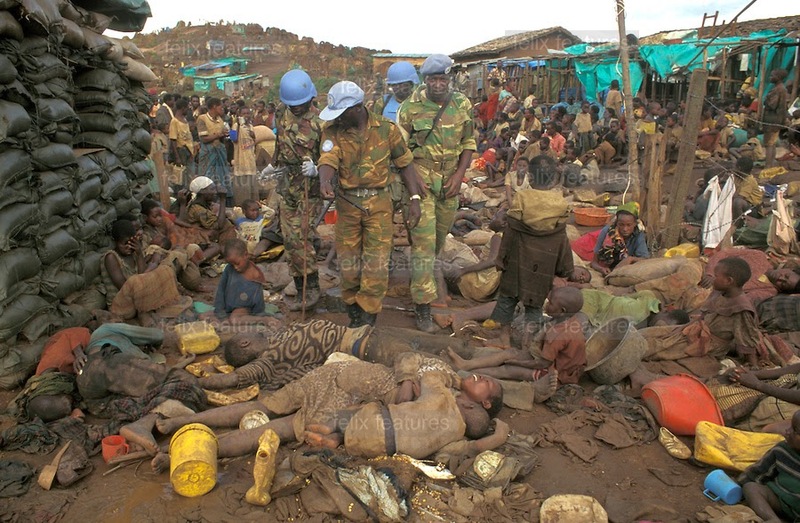 In a land where there is reconciliation and forgiveness each group confesses and ask for forgiveness of the crimes committed, but that is not for the RPF duty to acknowledge the killings of millions of Hutus both inside and outside Rwandan territory. This is because people like Mr. Jean de Dieu Basabose believe that they are the only once who are the victims the rest of Rwandans who died it was a collateral damage and their lives do not deserve justice. The Tutsi government in Kigali does not feel that there is any need for accommodation because they have the power and people who will be broadcasting their propaganda to show how much they suffered in the hands of extremists Hutus in 1994. This led us to the last but not least theme of reconciliation that have been ignored by both the Kigali government and Basore’s approach to peacebuilding in Rwanda. This is accommodation. · Accommodation: many so called peacebuilding organizations in Rwanda have not promoted accommodation values. This is because of two elements involved one being that the Tutsi led government in Kigali has never tolerated a genuine reconciliation among Rwandans because it fears that once reconciliation in achieved then it will lose its cling on power. Once Rwandans are genuinely reconciled, Tutsis will have nothing to fear and will swing their political allegiances to more content based politics than tribal politics. This will rob the Kagame government support of many Tutsis who see Kagame as their savior in case Hutus revolt against his regime. Once Hutus and Tutsis are genuinely reconciled they will need to speak out the truth about what happened in 1994. This truth is a bitter pill to the Kagame’s regime and people who support him because there is no truth in Rwanda that does not involve who shot down the Habyarimana’s plane which sparked massacre in Rwanda. This involves Paul Kagame as the main suspect who are likely to face international anti-terrorism court to answer to the charges. This deprives the RPF regime powers that they have been enjoying for the last 21 years based on fear mongering among Tutsis. Therefore it could be a mistake to entertain accommodation of Hutus in Rwanda. Another element involved is the so called peacebuilding organizations in Rwanda such as Shalom Educating for Peace, survive because they sell their product as people who are promoting peace and reconciliation among Rwandans. If there was no conflict among Rwandans these people would be out of jobs and won’t be able to pay their bills. Therefore they preach water on one hand and take wine on the other hand. If these people were genuine to themselves and the causes they are forwarding Rwanda would be reconciled today but they are not. Mr. Jean de Dieu Basabose go out there in Western countries and boldly lie to the world in spite of numerous facts that prove that both Hutus and Tutsis killed each other during the Rwandan genocide and Tutsis under Kagame’s leadership killed innocent Hutu refugees in DR Congo where more than 8 million of Rwandans and Congolese were slaughtered by the RPF military between 1996 and 2003. As I conclude, Paul Kagame and his people fear accommodation theory because it means taking the national cake and ask them (Tutsis in power) to share it with Hutus. This would mean that the 84% Rwandan Hutus would be given equal opportunities to participate in the scholarship pool that young Tutsis have been enjoying for the last 21 years taking more than 90% of education opportunities despite that they only make up 14% of all Rwandans. This action has denied many young Hutus opportunities to further their education, instead were sent to vocational education so that they will not assume any professional office in Rwanda. Lack of accommodating regime in Rwanda has denied millions of Rwandans to know the truth about the shooting down of the Rwandan and Burundian presidents who perished in the plane. Lack of accommodating society in Rwanda, especially those who have access to means of leadership, economy, and military defense have denied millions of the Rwandan Hutus to actively participate in national building process which undermines national cohesion, which is a pillar to genuine reconciliation. Lack of accommodation means that Hutus who lost millions of their relatives to the Kagame led soldiers will never access justice. 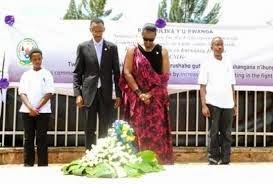 Only Tutsis will always be given opportunities to mourn for their dead killed by the current regime in Rwanda. Lack of accommodation means that Hutu children who were orphaned by the RPF will never have opportunities to access FARG and other funds set aside by both the RPF government and donors to support genocide orphans so that they can easily access education. Rwandans who are not pursuing truth, justice, and genuine reconciliation such as Mr. Jean de Dieu Basabose continue to be the hindrance to building a cohesive nation of Rwanda 21 years later. There is no doubt that the Rwandan Genocide Commemoration focuses more on marketing Paul Kagame as a savior of Rwanda than promoting healing and reconciliation among Rwandans. In addition, the commemoration month is like an apocalyptic day for many Rwandans and so it has been in the last 18 years. 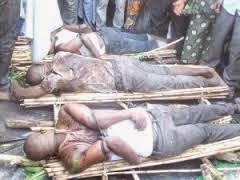 This is because it is the only time the RPF soldiers are allowed to kill any Hutu they fell pleased to do so. It is also a one month that Rwandan Hutu business people are openly asked to give money to Tutsi survivors, those genuine survivors who witnessed the genocide in 1994 and the bogus genocide survivors who were hiding in Uganda when the genocide was taking plane in Rwanda, they all use the Tutsi ticket to extort money from helpless Hutu business communities to buy their existence. It is the only month that radio FMs are shut practically in most of all Hutu families, not because that is what they want but because they want to hear anything happening outside of their houses, especially the footsteps of the Kagame’s men who come in the twilight to kidnap innocent Hutus and make them disappear without any substantiated reasons. 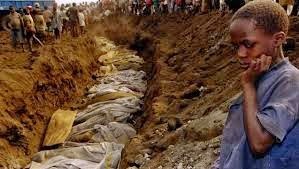 The month of April is referred to as the dead month by most of the Rwandans because that is when many unrecorded deaths that take place without any follow up as long as the victims are from the Hutu tribes they know that Rwandan justice does not protect them in the month of April. It has been 21 years since Rwanda was befallen by the darkest angel of time. Before some of the Rwandans from the Tutsi tribe living in exile in Uganda decided to invade Rwanda claiming their alienate rights to come back to their homeland, Rwanda was considered to be the Little Switzerland of Africa La Petite Suisse de l'Afrique Centrale. For those who were children attending basic educational institutions on different hills of Rwanda, we can attest to this. I remember as a young boy in a primary school I could only pay less than Francs 100 as a school fees for the entire year. This gave me access to all teaching materials that our school could afford such as dust chalk, slates, reading books, and exercises books. More importantly, we were taught by motivated teachers who were called to impart us with their knowledge and unconditional love. During those days, clinics had medicines and I never heard my mother looking for her healthcare membership card of “mutuelle” so that she could take me to hospital. We did not have to sell any livestock so that we become members of any national healthcare system in Rwanda. I remember clean and tapped water fountain in our school compound so that children could have access to clean water. Coffee, tea, and pyrethrum farmers were put in cooperatives and got incentives from their government so that the government theme of “Rwanya Nyakatsi” (Get rid of thatched houses) could materialize. 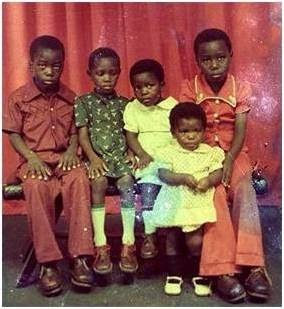 Without being forced or threatened by the local defense or Intore (cadres) for the first time I saw my dad taking us to Trafipro where he bought us plastic shoes called Bata and on the same day on our way home each of his 6 children carried a roll of corrugated iron sheet called Amabati. I don’t remember how many of Mabati that each one carried but they were so many because but the time we got home in the evening our necks had bent. Despite heavy loads we were all smiles when we got home because we were all wearing plastic shoes and we were among few in the village. It did not take long before every family in our community had bought shoes to their children. In less than two months we were all allowed to come to school with shoes and the government did not need to force our parents to buy us shoes but they created an enabling environment for our parents to afford shoes for us and build modern housing for their families instead of being told not to visit the market wearing barefoot. All these changes took place in my rural home because Rwanda was the “Little Switzerland of Africa” and we did not need western media to tell us because we lived it. However, all this changed when the country entered into war with herself. Those from Uganda came telling us that all was not well within our villages. They started from Umuganda (which means coming together in common purpose) and showed us how oppressive the activities were. They even told us that once they come to power they would pay us for participating in Umuganda. It did not take long before we rallied behind them who could not have done so hoping to earn an extra income from the public duty? As the war continued they promised us free primary and secondary school education. Since man always wants more freebees we stretched our arms to welcome them home. Some of our dads even went to the extent of fundraising for them as long as they carried through their promises to remove us from the big ship that was moving slowly and take us into the small boat that was sailing swiftly. They had pressbriefings both regionally and internationally and reached us through Muhabura airwaves to explain to us that the small boat would take us faster from the “Little Switzerland of Africa” to the unknown Promised Land. We forgot a Rwandan saying says that ‘Uwambaye Ikirezi Atamenya ko Cyera’ (loosely translated that who owns a beautiful pearl does not know that it bling). It did not take so long before the small boat (Rwandan Patriotic Front RPF) started tossing some of her passengers into the waters for them to drown but we were too intoxicated by her heavenly promises of taking us to the promised land sooner that the ship nicknamed the Big Mama (National Revolutionary Movement for Development MRND) could have done. We blindly followed them despite that there were nerve breaking facts that the small boat was had thrown most of her passengers into the rivers that she sailed through. Some of our dads decided to ignore this and decided to take some of our footballer siblings to hold friendship matches with members of the small boat crew. Our dads couldn’t hold themselves from thinking about how things will be when the small boat reaches to the other banks of the river. They never ceased from dreaming how their lives will change once the small boat gets them to the Promised Land. They even told me that they were so disgusted by the speed of the Big Mama. They claimed that it could take us centuries for her to take us to the Promised Land. Our fathers connived and schemed about how to get rid of the Big Mama as soon as possible. They claimed the long they waited for the Small Boat to take us to the Promised Land the longer and harder the journey becomes. After hearing this our fathers were filled with joy and excitement. One of our fathers who had defected from the Big Mama stood up and said: “My lord, may these walls of this hall also hear this. From now on don’t beg us to follow you instead show us the way and you lead we shall follow. Don’t ask us to jump again because what we will ask is how high you want us to jump my lord. Henceforth we will follow you wherever you go as the biblical story of Ruth and her mother in law my lord. We no longer mind how many of our sons and daughters you toss into the deep waters, how big the territory you occupy, and how many our siblings’ heads will be smashed against the wars or will be driven into exile. No matter what we will follow you my lord. Before the dawn settled on the ridges of the Thousand Hills, the Small Boat had been welcomed into our courtyards. We were never bothered a lot because our fathers had said and we had obeyed. We thought this would reduce the numbers of our siblings tossed into the deep waters, not at all. The Big Mama had been pushed to the walls and the peace we knew as children was now things of the past. Our faces started reading only one ink that of despair but we held on our hopes because our fathers were singing peace and the coming of Singapore to Africa in unison. Now the Small Boat and the Big Mama were roaming into our backyards, the oxygen was running out of reach and each one of us was trying to grasp some fresh air. Our fathers had left us and went into the streets singing and chanting “Gisunzu Navaho impundu zizavuga” as they were predicting the departure of Habyarima. They hoped that his departure will mark the end of their sufferings and pave the way for the Singapore of Africa. But little did they know that they were myopic to the real problems of Rwanda and their solutions. It did not take long before we as their children we joined them on the streets of Kigali. We danced, chanted, shouted, and schemed. I could see that the mob psychology was guiding us to the point that we could no longer see the motives and intentions of the captain of the Small Boat. He graciously sat on the hill of the hills and glanced at in the streets and he just laughed mocking us. As some of us were blindly pointing their fingers to the north others to the south as the origins of their miseries, the captain of the Small Boat was busy dispatching his crew to the different areas of the capital. Before we could know it the first son of the Big Mama had already sunk into the deep sea. He held the passcode to the maneuvering of the Big Mama. We all sunk with him those who survived went into exile. What amazed me most is that some of our fathers who had served the Small Boat in all kinds of manners hoping to bring us the Big Singapore of Africa followed us into exile after tossing most of their kids into the big river. They came and found us wandering in foreign land. They found us with new identity. We were no longer Rwandans but refugees. When I saw them I couldn’t hold back I had to inquire from them what is chasing them. “Dad’ and ‘Uncle”, I called. “How come you are here with us, did you miss the border?” I asked. “Son, all those old promises were empty. We were fooled and followed but now the waters have turned,” he replied. Although I was still young to understand what he meant when he said that the waters had turned, few months in exile had made me grow older and wiser. I knew my ‘father’ had seen the light when it was too late. We were now in exile called names by the host families. Although I felt humiliated I liked it when Congolese called us hopeless and homeless refugees in my ‘father’s’ presence. 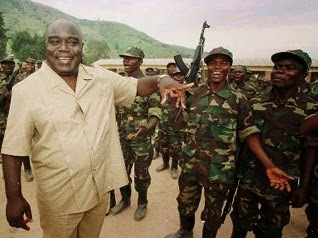 He was a man full of ego I couldn’t help but to smile as I saw him being reminded that our country is Rwanda not Zaire. Another day we went together with my ‘dad’ and my ‘uncle’ to the Red Cross site to get our weekly ratio. Since he joined us in the refugee camp late after his family that included myself and my four siblings had already registered and gotten a ‘food ratio card’, he registered as lonely man and his ratio was only 25ml of cooking oil, 25gm of salt, 1500gms of corn floor, and 700gm of beans. When they called his name and handed him what he deserves, he felt agitated and started reminding those present who he was befall the Fall of the Plane. Although he was my ‘dad’ I couldn’t stand there and look on while his hurting the feelings of the public who previously had put all their trust in him so that he can join hands with the captain of the Small Boat and ferry us to the new found land called the Singapore of Africa. I turned and looked at him straight into the face and said: “Dad’ here people are no longer interested in the long stories of the ‘quand j’etais.’ Welcome to the new Singapore of Africa Daddy,” I said to him. For the first time my dad had seen me staring straight into his eyeballs mercilessly. That is when he realized we had crossed the border into Zaire and things were no longer at ease, because the Plane Had Fallen. · Mr. Captain when the plane fell the heavens and the skies fell on us too. You had promised us peace but you broke us into pieces. When the plane fell the cloud of darkness fell on those who loved you and those who loathed you. When the plane fall the worst came down with it and the ridges of the Thousand Hills were bathed with blood instead of milk and honey you promised us in Kinihira. When the plane fell millions of Rwandans fell with it since the gods of Rwanda had deserted us. Mr. Captain of the Small Boat when the Plane fell……!!! 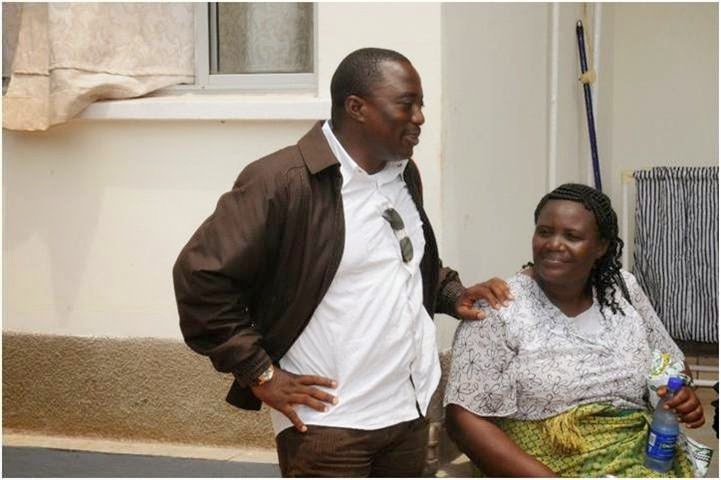 · I remember that you told us that when you come to power you will not force us to go to Umuganda and if we went you would compensate us for the time wasted and energy spent. However, 21 years on if I don’t attend your Umuganda it would be a different story of my life. If your men in the uniform don’t make me disappear from the face of the universe I will certainly rot in Mabuso but if I am lucky you will send me to 1930 and accuse me Kugandisha. · Mr. Captain, when our dads met you in Kinihira during the famous friendship soccer match you promised them that you will unite north and south. You will bring east and west together so that we are all called Kanyarwanda and abolish la zizanie and divisionism enthroned by the Big Mama. However when you came things got worse. You called us different names from Abasope, Abasajja, Abajepe, and Abadubai without adding Ibipinga because they are synonymous to Interahamwe. Mr. Captain before you came in the Small Boat we used to intermarry and it was not a big deal but with my Big Nose it no longer matters whether I am an MD or CEO in any company here in Kigali once I enter your courtyard members of the right tribe will give me Red even before the start of the game. You didn’t tell me whether you would feel happy if you’re English favorite team Arsenal was shown the door before the game? That is how we feel about discrimination in Rwanda 20 years into your leadership. · Mr. Captain, since the day when the plane fell things have never been the same. Not only you divided us further but you alienated some of us by depriving us our identity. You lied to us that being a Hutu or a Tutsi is a social construct element which sparked the ignoble Rwandan genocide. You might be right in some ways but you never stood up and tell all Rwandans who brought that plane down. You might think that because it has been 21 years on you have fooled Rwandans enough to forget the beginning of all this not at all. I hope you still have Blaise Compaore’s cellphone number. He can recount for you how many years it had been since the assassination of Thomas Isidore Noel Sankara. After all this is not what you promised Rwandans in the valleys of Kinihira or Mulindi. · Mr. Captain, you had promised us equality in all government apparatuses. You told us that the Big Mama had given all opportunities to those residing in the North but after 20 years I realized it was all lies and propaganda. The truth is that there has been no equality in any area in Rwanda if you think I am attacking you personally let me put things plain. Last year I finished my postgraduate studies at Nairobi University. My mother had sold her piece of land in Nyaruguru. This is after finishing with first class at the University of Rwanda in economics but I was never employed for 5 good years. Out of frustration my mother decided to sell her land so that I could go to Kenya to acquire more degree hoping that your system will concentrate more on my academic achievement rather than my big nose. However, by the time I arrived back in Kigali I was told that all the jobs had been filled by my classmates among them: Kayitesi, Kayirebwa, Kayitale, Kamuzinzi, Kayinamura, Kayiranga, Karutesi, Kayinamura, Karurangwa, Kamutuzo, and Kabano among others. After hearing that I pulled my transcripts out and asked them why not Nsabimana, Nsanzumuremyi, Nsabagasani, Nsanzurwimo, Nsabiyera, Nsanzumukiza, or Nsabiyera. They told me that it was an order from above but when I insisted to know who the above was, I was given a mirror and told to look at myself. Mr. President, after I looked at myself in the mirror I questioned no more and decided to head back to Nyaruguru. · Mr. President, 21 years on into your leadership there is a lot to be desired than admired. Your godfathers praise you for halting the genocide and you to have subscribed to this. However, I always wonder whether you promised us country filled with cemeteries and mausoleums. There are more than 3 million tombs around the country but no clear details about the dead. 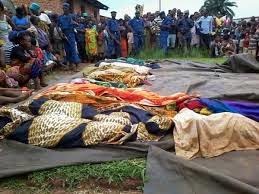 Could you let Rwandans identify their dead and mark their graves so that we don’t continue living in a limbo of these killed those and yet we Rwandans all know that we killed each other at the same rate if not as much? 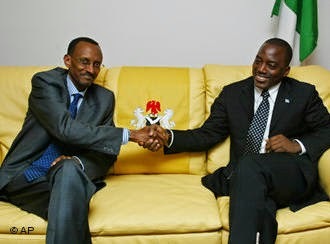 · Mr. President 20 years ago you promised to transform this little Rwanda into a little Singapore of Africa. You promised us that you will raise all Rwandans from the ashes to the greatness. You promised good life for all Rwandans but things have been different all along. If you were not aware let help you to understand that you Singapore dream remains a mirage to most Rwandans but a comic reality to the western media because that is their nature and the true picture they have about Africa. Before you came in a small boat we could only count on our fingers those individuals infested with jiggers but the last decades many communities around the country have experienced a boom in jiggers. I wonder whether the people in highlands stopped farming pyrethrum so that we can produce our own insecticide to help us fight this menace. I hope it is cheaper to import insecticide than buying the plastic Bata shoes to all Rwandans. Mr. President I don’t know whether you watched a news segment on TV1 that highlighted the flight of survivors in Gasabo. A family of a survivor with 4 children sleeping in a common pit latrine. Yes a pit latrine that is where they spent weeks before a well-wisher could come to their rescue. This shows you how ill this country is Mr. President. If a Tutsi survivor of genocide is going through that you can only imagine what a poor Hutu is going through in this country with a genocidaire mark hanging on his forehead Mr. President. Mr. President do you remember that you promised equality and a country that is governed by law? Yes you did so some 20 years ago but look now. In a country with 1 million orphans and 200,000 prisoners with 3 million tombs, 500,000 survivors, and one million refugees, where is justice for us Mr. President? In a country with only 11 million people with a GDP of US$464 per capita only you bought yourself 2 flits of jets while millions of Rwandans are starving to death. You took our brothers to Iwawa Island to hide them from the reality of life in Rwanda and mislead international community that you have no street children and your country is few miles away from achieving the Little Singapore of Africa. If my brother was not held at Iwawa Island now he would be dating and getting ready to marry but according to you because he is a Hutu he deserves no chance to grow up like any teen boy, date girls, go out with them, buy them flowers, cheat and get cheated by them, love and fall in love, break up with them and be dumped by them, just a natural way of growing up. Instead you have cast them away in a foreign land where they won’t feel family love at all. All in the name of building the Little Singapore of Africa. Mr. President, as I conclude this letter to you after a good 21 years of your leadership I want to let you know that I am not just a critique to your leadership just a reminder of how we Rwandans feel about you and your little boat that brought anguish and shame to our country. Your little boat ignited hatred, sparked a fire that consumed both living and nonliving ones. Your little boat left corpses wherever it sailed through both inside and outside Rwanda. We all carry your scars. I can’t ignore that there are those who call you their messiah because you gave them a country they needed so much. You improved their lives, took them to school, put them into international map, got them housing, got them education, money, jobs, life, and identity. They now worship you but it is a small portion of Rwandans. To most of Rwandans myself included, the last 25 years of your existence in Rwanda has been nothing but hell on earth. You first took parents at younger age and left me to fend for myself. Your small boat ate anything that brought me happiness from my uncles and aunties, father and mother, grandparents and relatives, neighbors and their children we liked playing football together and friends. You did not only take life but also the things. You didn’t pollute our beautiful rivers with corpses of young men and women, but also took away the names of our hills from Kigali Ngari to Bugesera and Kigali became Gasabo; Byumba into Gatsibo and Nyagatare, from Ruhengeri into Musanze and Gakenke; from Butare to Huye and Gisagara, Gitarama to Kamonyi and Muhanga, from Gikongor we all loved to Nyamagabe. You did not stop there because you went ahead and turned Kibuye into Karongi whereas the beautiful Gisenyi became Nyabihu and Ngororero whereas the beautiful Cyangugu became Nyamasheke and Rusizi all this in the name of building a New Singapore of Africa. However, Mr. President there is one common thing I saw in all these regions. They all share one common denominator of grief. They all grief for their beloved ones that your small boat tossed into the big waters and they never came back. Some mourn on yearly basis because you gave them right but others grieve on daily basis because you denied them their alienate rights to mourn for their dead. You can only change the names of regions and roads. You can change the name of rivers and lakes but you cannot change south and north. You cannot run from the facts that Rwanda has achieved only one thing. That is to become not the Little Singapore of Africa as you had promised us earlier, but the Little Singacorpses of Africa where graveyards are exhibited like shopping stalls. 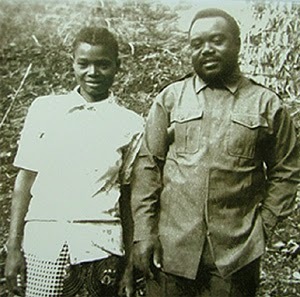 Joseph Kabila, de son vrai nom Hyppolite Kanambe Kazemberembe, est né le 4 Juin 1971, d’un père rwandais nommé Christopher KANAMBE et d’une mère rwandaise Marcelline MUKAMBUKUJE. 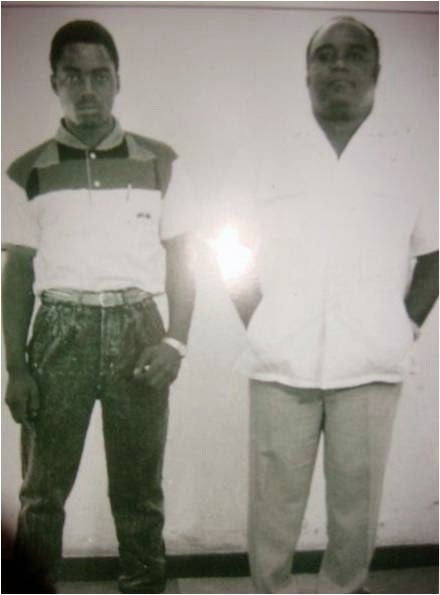 Son père fut un opposant à l’ancien président rwandaisJuvénal Habyarimana. Il rencontra Laurent Désiré KABILA, opposant de l’ancien président zaïrois Mobutu, dans les mouvements de résistance basés dans les montagnes à la frontière rwando-zaïroise, d’où ils se sont battus contre leurs ennemis communs:MOBUTU et HABYARIMANA. 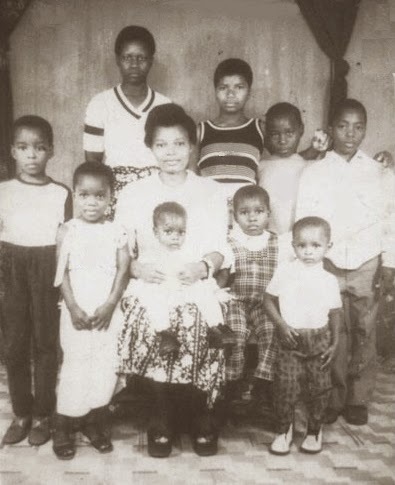 Après la mort de son ami Christopher Kanambe en 1977, Laurent Désiré Kabila est marié (selon les coutumes traditionnelles) à la veuve de Christopher Kanambe,Marcelline et adopte ses deux jeunes enfants jumeaux, une fille et un garçon: Jenny KANAMBE et Hyppolite KANAMBE. LD Kabila, qui avait plusieurs femmes (dont plus de 13 -) quand il entra dans la clandestinité et dont il a eu un certain nombre d’enfants (plus de 25), n’avait pas le temps de prendre soin d’Hypollite Kanambe et sa soeur Jenny. Comme il n’a pas été en mesure de terminer ses études au-delà du niveau secondaire, le jeune Hyppolite Kanambe a été contraint de faire plusieurs emplois, parmi lesquels “taximan, barman, mécanicien, vendeur à la sauvette…” dans les villes tanzaniennes de Dar es – Salaam et Kigoma. En Effet, son «père adoptif» (entendre «beau-père»), LD Kabila, vivait avec toute sa famille en exil en Tanzanie pendant l’enfance et l’adolescence d’Hyppolite. Kabila a passé plus de son temps en exil dans le trafic de l’or et du diamant plutôt que la lutte contre le régime de Mobutu; qui, souvent, l’a amené à traverser les forêts et les montagnes de la Tanzanie, le Burundi, le Rwanda et l’Ouganda, pour exercer son entreprise frauduleuse. En 1995, Hyppolite Kanambe décide de revenir à sa patrie le Rwanda, où il est accueilli par son oncle James Kabarebe, le colonel et chef des services de renseignement de l’Armée patriotique rwandaise (APR), qui l’accueille dans sa propre maison. Dans un premier temps, Kabarebe trouve pour son neveu un emploi comme «chauffeur” d’un camion de livraison et transport de marchandises à Kigali, avant de l’employer comme son chauffeur privé. 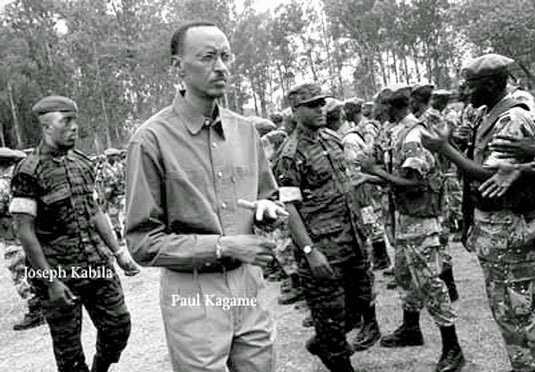 En 1996, lorsque les Américains lancent leur opération militaire pour préparer l’invasion du Zaïre, Paul Kagame nomme le colonel James Kabarebe en tant que chef des opérations militaires et responsable du “Fichier Zaïre». Il supervise le recrutement et la formation des nouvelles recrues de la base militaire. C’est ainsi qu’ il insère son neveu Hyppolite Kanambe au programme de formation, afin de l’incorporer, à un stade ultérieur, à l’opération de l’invasion du Zaïre qui est amorcée. 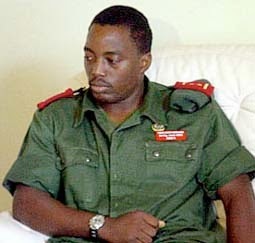 Hippolyte Kanambe a servi dans l’armée rwandaise en 1995. Plusieurs témoins ont également insisté sur le fait incontestable que alias Hippolyte Kanambe «Joseph Kabila» parle couramment kinyarwanda, la langue vernaculaire du Rwanda. Ces zones sombres sur la mort de Laurent Désiré Kabila que personne ne veut éclairer, ont déjà versé beaucoup d’encre sans que le mystère qui les entoure ne soit dévoilé. Loin de nous l’idée de fournir ici les causes cachées et l’identité définitive des véritables auteurs de cette tragédie qui fait désormais de la politique congolaise une saga. Cependant, tout en découvrant quelques circonstances qui ont précédées et suivies la tragédie de l’assassinat de Laurent Désiré Kabila, jusqu’à l’ascension de Joseph Kabilaau sommet de l’État, nous ne pouvons qu’être inquiétés par la concordance, la cohérence et la convergence de ces faits qui le placent au centre de la suspicion. Mme SIFA Mahanya, présenté à tort comme étant la mère biologique de Joseph Kabila, est congolaise, et ce est l’une des nombreuses «épouses» déclarées ou connues de LD Kabila avec qui elle a eu 6 enfants nommés: Joséphine, Cécile, Masengo, Gloria, Kiki etMaguy. 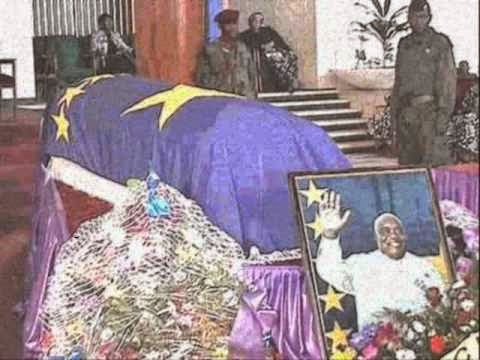 Mme Sifa vivait avec son mari dans le Palais de Marbre, la résidence officielle du chef de l’Etat quand à la fin d’Octobre de l’année 2000, Laurent Désiré Kabila a un inconfort sévère après un repas. Les examens médicaux pratiqués immédiatement diagnostiquèrent un empoisonnement. Les enquêtes menées par le personnel de la sécurité présidentielle soulevèrent un faisceau d’indices sérieux qui convergèrent vers Mme SIFA, qui sera accusée de tentative d’assassinat de son mari et est immédiatement arrêté sur ordre de LD Kabila, et emprisonnée à la prison de Makala dans le pavillon N . 10. -ACTE II: Kinshasa, le 11 Janvier 2001: l’exfiltration de Mme Sifa du centre pénitentiaire Derrière le dos de LD Kabila, Joseph Kabila organise l’exfiltration de la prisonnière de sa cellule, avec la complicité du directeur de la prison, M. Kelly DIDO KITUNGUA. Mme Sifa Mahanya est immédiatement transféré secrètement à Lubumbashi où elle est logée dans un endroit tenu secret. 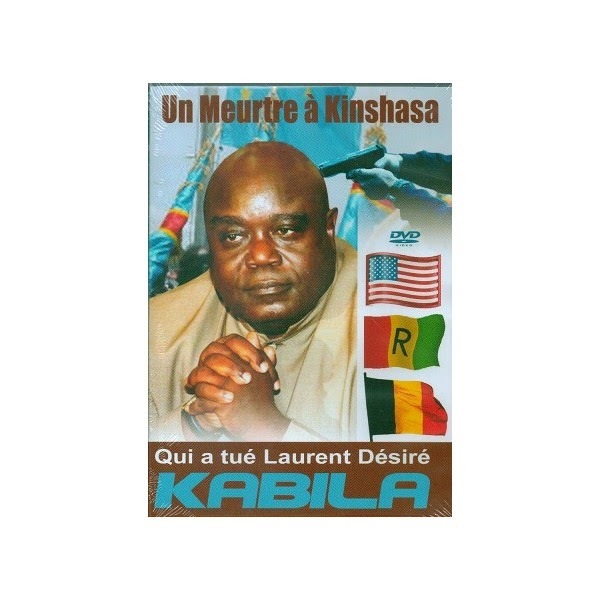 ACTE III: Lubumbashi, le 12 Janvier 2001: LD Kabila est conseillé d’annuler son voyage au Cameroun. Le lendemain de l’exfiltration de Mme Sifa Mahanya, Joseph Kabila contacte son «père» qui s’apprêtait à voler vers Cameroun pour participer au Sommet mondial de langue française. Joseph conseille Laurent Désiré Kabila de ne pas aller au Cameroun sur base de renseignements fiables en sa possession, des renseignements faisant thèse d’un complot contre le président de la RDC. Laurent Désiré Kabila qui se confie profondément à son «fils» annule son voyage au Cameroun. De Lubumbashi, où il était, le chef de l’Etat revient directement à Kinshasa. 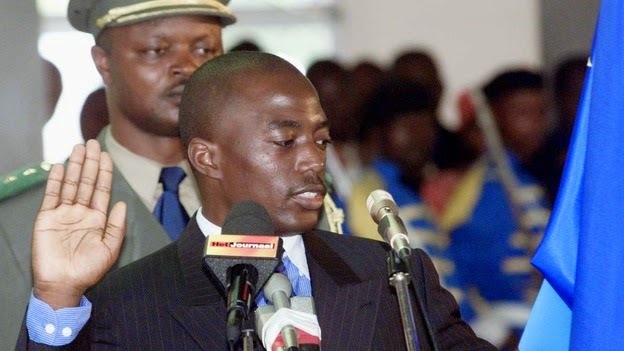 Acte IV: Kinshasa, le 15 Janvier 2001: Joseph Kabila ordonne le désarmement de la garnison de Kinshasa, puis il quitte la hâte à Lubumbashi. Le jour avant le drame, sur l’ordre de Joseph Kabila, tous les militaires FAC de la garnison de Kinshasa sont désarmés sans aucune explication. Bien plus, le colonel Eddy Kapend reçoit des ordres stricts de Joseph Kabila de procéder à l’arrestation du chef du renseignement extérieur de l'(ANR / DE), M. Ismaël Tutwemoto. Ce est M. Leta Mangasa, le général en chef de l’ANR chef Administrateur général qui exécute cette arrestation. Après avoir pris toutes ces mesures apparemment «inexplicables», Joseph Kabila s’envole rapidement et discrètement à Lubumbashi d’où il fait un voyage mystérieux en dehors du pays. Au milieu de la journée, des coups de feu se font entendre au palais des marbres, la résidence présidentielle. Laurent Désiré Kabila est grièvement blessé à la tête, meurt peu de temps après, avant même d’être chargé sur l’hélicoptère qui le transporte à l’hôpital privé Ngaliema. C’est à la nuit tombée que Joseph Kabila donne l’ordre d’ouvrir l’aéroport de N’Djili fermé depuis l’annonce de la tentative de coup d’Etat, spécialement pour lui, pour permettre l’atterrissage de son avion en provenance de Lubumbashi. Ce comportement de Joseph Kabila semble à tout le moins étrange. Comment se fait qu’un “fils”, qui suit minutieusement la sécurité de son “père” jusqu’à la veille, et qui conseille l’annulation de son voyage au Cameroun, car un danger mortel imminent se projetterait, et curieusement à l’annonce de l’attaque sur son «père», ce «fils” soit resté cloîtré à Lubumbashi, à seulement 2 heures de vol de Kinshasa, et rejoint la capitale qu’à la fin de la journée, plusieurs heures après la mort de son père? Où était-il passé la journée? Qu’est-ce qu’il faisait pendant tout ce temps? D’où provenait-il vraiment? Lubumbashi n’était-il pas une diversion? Autant de questions sur les causes sous-jacentes de la mort de Laurent Désiré Kabila auraient dû être examinées. Cependant, nous avons travaillé pendant des années pour connaitre la vérité, et aujourd’hui, de nombreux témoignages enregistrés sont examinés. Les témoignages formels du personnel médical congolais qui avait reçu le corps Laurent Désiré Kabila à l’atterrissage de l’hélicoptère confirment fortement que le président congolais était bien mort avant son arrivée à l’hôpital privé. Cependant, Joseph Kabila, qui avait pris le contrôle des opérations autour de “son père”, a ordonné le transfert du corps de Laurent Désiré Kabila à Harare au Zimbabwe. Il multiplie ensuite des communiqués trompeurs adressés au peuple congolais pour le persuader que son président était ainsi vivant. Dominique Sakombi sait beaucoup à ce sujet, puisque celui qui informait à la télévision nationale la supercherie. Au contraire Louis Michel qui à l’époque était ministre des affaires étrangères belges sera le premier a annoncer la mort de LD Kabila le 16 février vers 11h00 “T.U”: comment un ministre des affaires étrangères belges, se trouvant à Bruxelles, est au courant de la mort du président d’un pays qui se trouve a 8000 km de distance, et annonce sa mort avant tout le monde, alors que les organes officielles de ce pays démentent la nouvelle? Pourquoi cette mascarade et ces mouvements macabres autour de la dépouille mortelle d’un président de la République? Un autre mystère! Mais le dossier détaillé de l’assassinat de Laurent Désiré Kabila fera l’objet d’une autre instruction. *LOI VI: Kinshasa: Au cours des funérailles, Sifa Mahanya est présenté au public comme «veuve éplorée», puis comme «mère biologique» de Joseph Kabila! 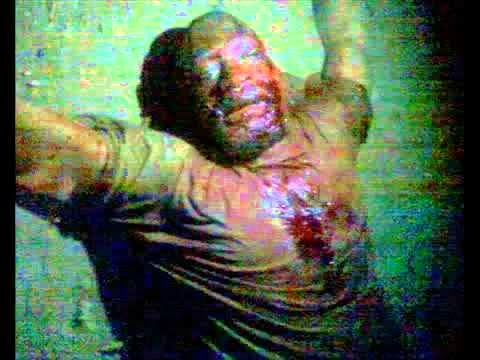 Pendant les funérailles de Laurent Désiré Kabila à partir de Harare et jusqu’au 23 Janvier 2001, avec l’enterrement à Kinshasa, Mme Sifa Mahanya, la prisonnière exfiltrée de sa cellule cinq jours avant l’assassinat de M’zee, cachée à Lubumbashi jusqu’ici, sort de sa cachette et est propulsée sur la scène national. Elle est soudainement présentée à la presse nationale et internationale comme «la veuve éplorée» du président défunt, et la “mère” biologique de Joseph Kabila qui vient de prendre la place de son “père” dans des conditions que nous connaissons. Cependant, dans sa vie, pendant toute la guerre et pendant son mandat à la tête du pays, Laurent Désiré Kabila n’a jamais montré officiellement la «première dame» au peuple congolais. En d’autres termes: son épouse officielle parmi sa douzaine de femmes, et celle qui a été présentée comme «la veuve éplorée” a été exfiltrée de la prison où elle a été détenue pour tentative d’assassinat sur son mari par empoisonnement. Et l’auteur de cet exfiltration est celui-là même qui a pris le siège de la victime, et dont Mme Sifa donne pour la première fois, le témoignage honorable d’être «sa mère biologique”. L’élaboration de ce scénario du début à la fin, contient des erreurs vulgaires qui appellent à tous les Congolais de se questionner à propos de cette tragédie que la République démocratique du Congo traverse. babane nabahutu. Bashakaga kugaruka bagashiraho ingoma ya EMPIRE HIMA aho abahuu bazababera abacakacara naho abahutu bose bize bakicwa. Niko byagenze rero abatutsi bose aho bari kwisi barakoranye bemeza umugambi wo kugura imbunda bakajya i Rwanda mugukuraho umwanda wAbahutu. Ikimenyimenyi nuko abatutsi bari bakomeye kandi bari barakamiwe nubutegetsi bw'Abahutu nka Bwana RWIGARA ASSINAPOL, KAJEGUHAKWA, MAJYAMBERE SILAS, NA SISI EVARISTE bose bari barakamiwe n ubutegetsi bw'Abahutu cyane cyane bwa Habyarimana Juvenal babaye abambere mukugura intwaro zo kwica abahutu bahereye kuri Habyarimana Juvenal wari waraboroye. Muli make gahunda y'Abatutsi hafi yabose yariyo kumaraho abahutu ariko Imana irengera imisega ntiyigeze ihumbya. Ibyo bari barateguye gushira mubikorwa ntibyageze kumugambi nyawo ahubwo warabapfubanye aba aribo ugarukira maze bibonera urwo imbwa yaboneye kumugezi. Nubwo bashoboye kwica amamilioni yabahutu mugihugu cyose uhereye i Kagitumba i Byumba ukageza i Mbandaka ho muri DR Congo, ntibabonye umugambi wabo wuzura wo kwica abahutu ruhongohongo maze bagafata igihugu ntamubare munini w Abatutsi uhaguye. Ntawashidikanya ko abahutu bo bifitiye ibibazo byabo akaba ari Imana yi Rwanda ibirindira gusa kuko ntanukuntu byumvikanaga uko Abatutsi babashije gutera u Rwanda leta ifite ingabo ibihumbi 6000 gusa. Ntagushidikanya ko mugihe cya Habyarimana aribwo abatutsi besnhi babashije kujya mumashuri abandi bakagira ubucuruzi bukomeye ariko ibi abatutsi ntibigeze babimenya kuko umururumba wubutegetsi wakomeje kubibagiza ineza yAbahutu ahubwo inyota yubutegetsi nubukoloni aba ariyo iyobora ibitekerezo byabo kugeza ubwo babaye nka ya mbeba muri Gakoco. Ikibabaje kurusha byose nuko Abatutsi bose bitangiye umugambi wokwica abahutu umusubizo bagakoresha namafranga bari barakuye kungoma yabahutu bayaha inyenzi mukugura intwaro zo kwica abahutu baje kubonera urwo imbwa yaboneye kumugezi. Kagame yagiye abakocora umwe kurumwe kugeza ubu hasigaye mbarwa. Baguze inkota none niyo ilimo kubaca amajosi. Izo nkota nkuko babeshyera abacuruzi babahutu ko baguze imipanga yo kwica abatutsi ndetse namafuni anariyo FPR yamarishije abahutu, none inkota abatutsi baguze yo gutsembatsembaho abahutu niyo ilimo kubica ruhongohongo. Naho rero nkuko umugani wikinyarwanda uvuga ngo urucira mukaso rugatwara nyoko ntampamvu nimwe yatumye abahutu bakurura amazuru ngo bagiye kuririra abatutsi bahotorwa ningoma yabo kenze nyine ubugoryi bw Abahutu butajya bushira. Muri make dore impamvu 10 zagombye gutuma ntamuhutu ufite mumutwe hazima wagombye gukurura IBIZURU ngo araririra abatutsi bishwe na FPR yakwenze ali babatutsi nabatutsikazi barangwa numutima wubworoherane no gukunda abandi. COL. KAREGEYA:yanizwe uwa kajwiga mbona ibihutu byakuruye amazuru ngo ngaho Kagame abiciye umuvandimwe. Ibi byanteye kwibaza niba izi ngirwa bahutu zaribagiwe ko Abahutu bakubiswe udufuni haba hanze cg se hano imbere mu Rwanda byose bitarateguwe kandi bigashirwa mubikorwa na Bwana KAREGEYA. Muribo twavugamo Abanyandanini nka SETH SENDASHONGA na COL. RIZINDE THEONESTE bakubitiwe urwingusho mugihugu cya Kenya mumugi waho wa Nairobi kumanwa yihangu. Abandi bahutu bishwe urw'umugenda banyurujwe hano mu Rwanda uyu mugabo yabigizemo uruhare rukomeye. Igishimishije nuko FPR itamukubise agafuni nkuko yagakubitaga abo yafungaga hano mu Rwanda ahubwo ikamuniga iya Kajwiga agapfa yineyeho. Kumuririra nugutera Imana agahinda yo yamuciriye urwo rubanza kuko burya malipo ni hapa duniani. GEN. KAYUMBA NYAMWASA: Niba u Rwanda rwarigeze kugira umwicanyi ruharwa ndetse numuntu wanga Abahutu urunuka nyuma ya Paul Kagame na Tito Rutaremara hakuriiraho bwana Nyamwasa. yu mugabo ntagahunda nimwe yo kwica abahutu atigeze agiramo ijambo. Ywe noguhanura indege ya Habyarimana Nyamwasa yagizemo uruhare rukomeye mugupanga kuyihanura. Uyu mugabo abatamuzi bazabaze abaturage ba Kiyombe, Cyungo, Bwisige, Mukarange, Butaro, na Kidaho akaga abahutu bamuboneyeho. Ubwicanyi bwe ntibwigeze buhagarariraho. Muri 1996 niwe wapanze kandi ayobora gahunda yo gutsambatsemba abahutu bimpunzi muri Congo abifashijwe na amerika na UK muri ino video. . Kuba rero amsasu yicishije abandi bahutu hirya no hino mugihugu ariyo Bwana Paul Kagame yakoresheje kumukosora ndetse byahimba akanamukurmao umwuka, ntako bisa rwose. Ahubwo ibihutu bikambya IBIZURU ngo Kayumba bamurashe ibyo rwose nugusetsa imikara. Uyu mugabo naniwe kandi wategetse itsembatsemba ry Abahutu bo mukarere ka Ruhengeri na Gisenyi akaba we na Kagame bari bapanze kuhatera itabi mugihe bagombaga kuba bamaze kwic abahutu bose bari bahatuye. Ibi kandi byagombaga gukorwa nikompanyi yabanyamerika nabongereza yitwa British-America Tobacco Company. Ikindi kandi ubugome bw'uyu mugabo muri gahunda zo gutsemba abahutu bakubaka Empire Hima nanyuma yuko Kagame amwigera incuro 4 zose ashaka kumukuramo umwuka aracyahamya ko Abahutu ari babi kurusha abatutsi nkuko agenda abivuga mubiganiro agirira kumaradio hirya no hino. Kuririra ibyago Kayumba Nyamwasa aterwa nabenewabo babatutsi basangiye kwica abahutu nugutera Imana agahinda kuko ibimubaho ari urubanza rw'Imana. Iyo ibihutu bigenda byabyimbije amazuru ngo bigiye kwamagana Bwana Kagame ngo kuko yarakubise Nyamwasa urwingusho nukurimanganya no gushinyagurira Imana yo izana urubanza no guhorera abayo. RWIGARA ASSINAPOL: Uyu mugabo niba harabantu baguze intwaro nyinshi zo kwica abahutu uyu mugabo yabiherewe imidari igera kwicumi yo kuba yararwaniye ishyaka ubwoko bwe bw Abatutsi. Ababaye mumakambi muribuka ukuntu Company zuyu mugabo zitabi zazaga munkambi zilimo kugurisha amatabi yitwa Supermatch yakorerwaga muri Kenya. Ariko mubyukuri ntabwo zabaga ziza kugurisha amatabi ahubwo zakoraga akazi ko kuneka impunzi ndetse no keinjiza intwaro munkambi kugirango FPR nitera inkambi izasange intwaro zarahageze. Abahutu bakoreragaubucuruzi hanze bazi ingorane bagiye bhura nazo kubera urwango aba bagabo bari barashize mubanyamahanga. Kuririra urupfu rwe nugukina kumubyimba millioni zabanyarwanda bishwe na FPR hakoreshejwe imbunda namafuni yaguzwe na RWIGARA ASSINAPOL, KAJEGUHAKWA nabandi batutsi. Kuririra imfu zabo nuguhemukira Imana. Kuko abo FPR bashinze yishe nabo bari bafite imiryango yabakundaga. IBIHUGU bibyimbya amazuru ngo birimo kubibuka nuguhemukira nogushinyagurira abanyarwanda boshwe na FPR aba bantu bashinze mumugambi wokwica Habyarimana wari warabakamiye. UBUROZI BWO MUBIRYO NAMAZI IGOMA MUKWA 10/1994: Impunzi zabahutu zihungiye muri Congo abatutsi babahezanguni bibumbiye muri FPR bari barabipanze neza kuburyo bazakoresha bwo gutsambaho Abahutu ntibizongere kwibukwa ukundi. Nimurwo rwego FPR ifashijwe nabanyamerika,nabatutsi bari batuye muri Congo bahise baroga amazi yi Goma nibyokurya maze babijyana mumpunzi. Aha impunzi yose yarumyeho yahise ipfa aha niho barumuna banjye bane bapfu mukanya nkako guhumbya bakimara kurya Amandazi bari baguriwe. Ibihumbi birenga 200 byabahutu bimpunzi zahise zihagwa muri gahunda ya FPR yogutsembatsemba abahutu. Ariko nkuko Pasteri Mpyisi yaje nyuma kubibwira kagame ati urashaka gutsembatsembaho abahutu ntuzabishobora, Imna yacu yarengeye bamwe bakira ubwo burozi bwa FPR. KIBEHO MASSACRE: Kwibagira ibihumbi byabana bu Rwanda biciwe Kibeho bazize ikintu kimwe gusa kuberako ari abahutu nubushinyaguzi. Izi mpunzi zari zahungiye kukiriziya cya KIBEHO bibwiragako abafashe ubutegetsi ari abantu atari inyamaswa ariko KAGAME, KAYUMBA nabandi batutsi babahezanguni baje kwica izi mpunzi umusubizo hapfa ibihumbi birenga 30 byabahutu mumaso ya ONU nindi miryango mpuzamahanga. Aba bose bazize ko ari abahutu sinzi impamvu umututsi umwe yapfa kandi yishwe nabatutsi benewabo muzi nibyo badukoreye maze mugatunara ngo muratabaye. UGUFUNGA AMAHUTU BIZE IKIVUNGE HAGAMIJWE KUBICA: Abari batangiye kumenya ubwenge muribuka ukuntu FPR yafataga abahutu bagiye mwihembwa cyane cyane abarimu nabandi barabakozi ba leta muri 1995. Amazina yabalimu ba hano iwacu bashimuswe na FPR ntirugira iherezo twavuga nka:Minani JP, Mugamana Elie, Nkurunziza Pierre, Kabonero Emmanuel, Bigirimana AImable, Buhigiro Forduard, Komayombi Anstate, Nyirantegeye Jacquline, Nyirarukundo Lucie, Ufashwanayo Theo, Rukundo Epimaque, Bonaventure Habimana, Murekatete Annonciatta, Bigaruka Julien, nabandi bensh tutavuga bashimuswe na FPR. Abo bose bishwe muri ya gahunda ya FPR yatanzwe na Major Rose Kabuye yokugbanya abahutu muburyo bushoboka bwose kugirango Empire Hima izabe ifite abatutsi aribo rubanda nyamwinshi. Kandi ibi babikora nomuri gahunda yo guha ibitambo byamaraso Iluminati yabafashije gufata u Rwanda bakayisezeranira aamraso ingunguru nyinshi zamaraso yabanyarwanda. UGUTERA INKAMBI ZABAHUTU MURI CONGO BAKICA MILLIONI 3 ZABAHUTU :Iyi gahunda yajeho kuko FPR yari yamaze kubonako ibintu yayo byo kurimburira abanyarwanda mugihugu byari byayipfubanye. Niyo mpamvu Kagame na Kayumba bashizeho indi gahunda bashibgikiwemo na Amerika yokurimbur abahutu mumashyamba ya Congo. Bwarakeye batera inkambi maze bica abahutu karahava koko. Abahutu bihswe umusubizo guhera Kibumba, Kahindo, Katale, Mugunga, Masisi, Walikale, Amisi, Tingitingi, Kisangani, Ubundu, Ikella, Kinshasa, na Mbandaka.Ibi byose byakozwe kugirango bamareho abahutu. Umuntu rero wihadangaza wumuhutu agakurura amazuru ngo agiye mumihango yokwibuka umututsi wishe na benewabo uwo rwose nikigoryi. KUROHA ABASORE BABAHUTU FPR YISHE MUMIGEZI YU RWANDA; FPR ikimara kubonako kwica abantu bakabahamba bigenda biyikoraho habisemo kwigira umugambi wo korora ingona (crocodiles and caimans) mukiyaga cya Muhazi kugirango bajye bazigaburira imibiri yabana babahutu bamaze kwica. Nkuko byagaragaye FPR ikora ibishoboka byose kugirango ikomeze umugambi wabo wo kumaraho abahutu kandi ikabikora kuburyo bitamenyekana. Abahutu bishwe muburyo bwose ariko turacyabona bimwe mubihutu nyuma yimyaka 20 bikibyimbya amazuru ngo bararirira abatutsi bicanye. SONGAMANA YO MUMAJYARUGURU RUHENGERI NA GISENYI: YMurwego rwo kwica abahutu besnhi kandi mugihe gito. Abatutsi bo muri FPR bAGIYE BAKURIRA ABAHUTU bo mumajyaruguru maze bakabahuriza mubigo byamashuri ngo bali munama zimitekano. Ibi ntibyatindaga kuko mugihe FPR yamaga imaze kubashirahamwe yahitaga ibaminjirmao urusasu maze intumbi zigashingurwa mubyobo rusange ibyo bakomeje kubeshya ko hashinguemo abatutsi. Songamana zari hose mukarere kuburyo umugambi wo gutera itabi wari ugiye kugerwaho iyo Imana idakinga ukuboko. FPR ikomeza kubeshya ngo ni FDLR ibikora ariko aban yarwanda hafi yabose bazi ukuri kubwicanyi bwa FPR. IKINYOMA CYA FPR kuri genocide: FPR izi neza ko ariyo yatangije genocide kuko ariyo nzira yonyine yarifite yogufata ubutegtsi mu Rwanda. Ikomeza kugenda ivuga ngo Abahutu bishe Abatutsi ariko ntabwo itubwira uwahanuye indege ya Habyarimana yishe abapresident babiri babahutu aribo Habyarimana Juvenal na mugenzi we wu Burundi Cyprian Ntaryamira. Ibi FPR ibikorera kubera ya gahunda yayo yo gushiraho EMPIRE HIMA ikaba igamije kwangisha abahutu. Aya matiku rero ya FPR ntabwo ari ayo mumyaka 20 gusa ahubwo niko b atekereza burigihe bumvako aribo beza gusa kandi niba bapfuye tugomba kujya kubashangirira. 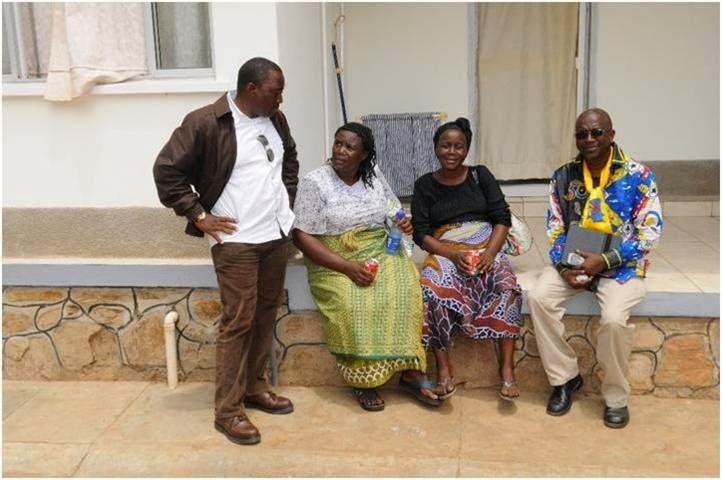 Ibihutu bibyimbya amazuru ngo bigiye kuririra abatutsi bicanye nibantabwenge. Ngizo rero ingingo zigera mwicumi dushize ahagaragara zituma ntamuhutu wagombye gukambya ahgahanga mugihe Paul Kagame yishe bamwe mubantu be bafatanyije umwug wo kwica. Abalimo kunigwa ubu iya rujwigira nibamwe banigaga abana babanyarwanda iya Kajwigira. Niba Kagame abahize akabica nukuberako baba bamubangamiye bitwajeko bakoranye nawe. Ntushyonze ibimwira.